Cameron, Wilfred Frank, 24, 13th April 1945, "B" Sqn. 10th Royal Hussars, Royal Armoured Corps, 7919617, Trooper, Son of William George and Catherine Winifred Cameron, of Cwmbran, Mon., RAVENNA WAR CEMETERY, I. C. 17. 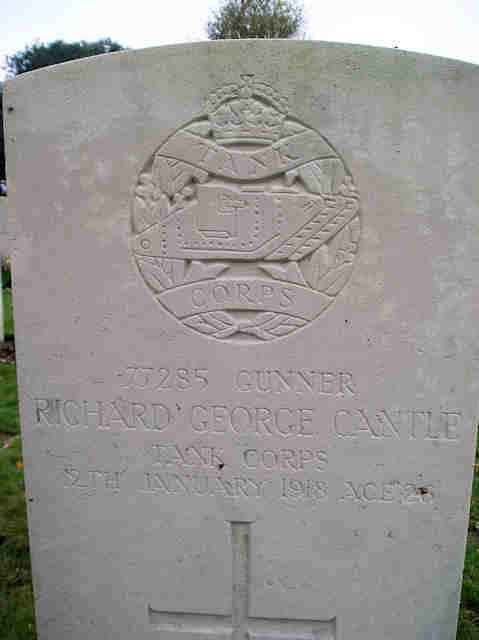 Cantle, Richard George, 26, 12th January 1918, 3rd Bn. 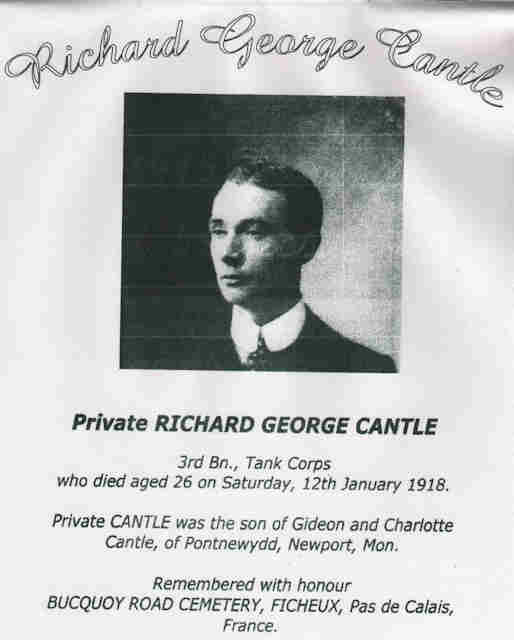 Tank Corps, 77285, Private, Son of Gideon and Charlotte Cantle, of Pontnewydd, Newport, Mon., BUCQUOY ROAD CEMETERY, FICHEUX, II. D. 16. Carpenter, Raymond, 20, 11th August 1944, Royal Navy, H.M.S. 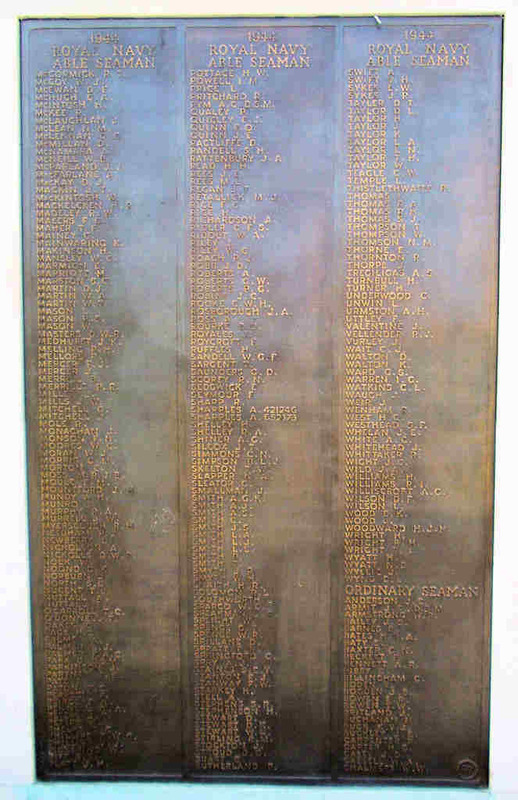 Albatross, D/JX 563504, Ordinary Seaman, Son of William John and Margaret Carpenter, of Ponmewydd, Monmouthshire, PLYMOUTH NAVAL MEMORIAL, Panel 87, Column 3. 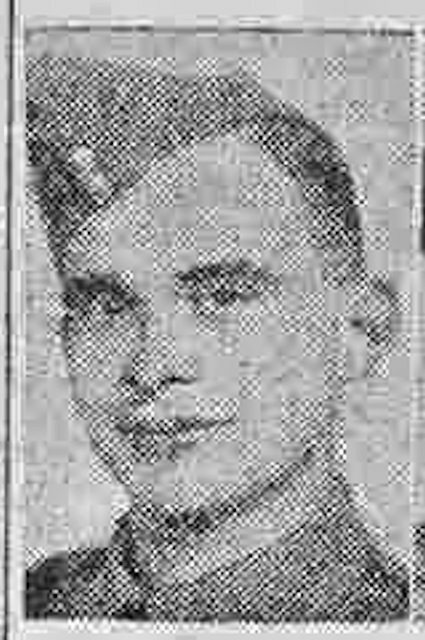 Caseley, Eric Roy, 21, 21st August 1940, Royal Engineers, 1906200, Driver, Son of Albert and Mildred Racheal Caseley, of Cwmbran, CWMBRAN CEMETERY, Sec. F. Row 8. Grave 2. Caseley, Reginald Job, 22, 4th December 1943, Royal Air Force Volunteer Reserve, 77 Sqdn., 159068, Pilot Officer (Pilot), Son of Albert and Mildred Caseley; husband of Joan Caseley, of Pontnewydd, Monmouthshire, BECKLINGEN WAR CEMETERY, 12. E. 4. 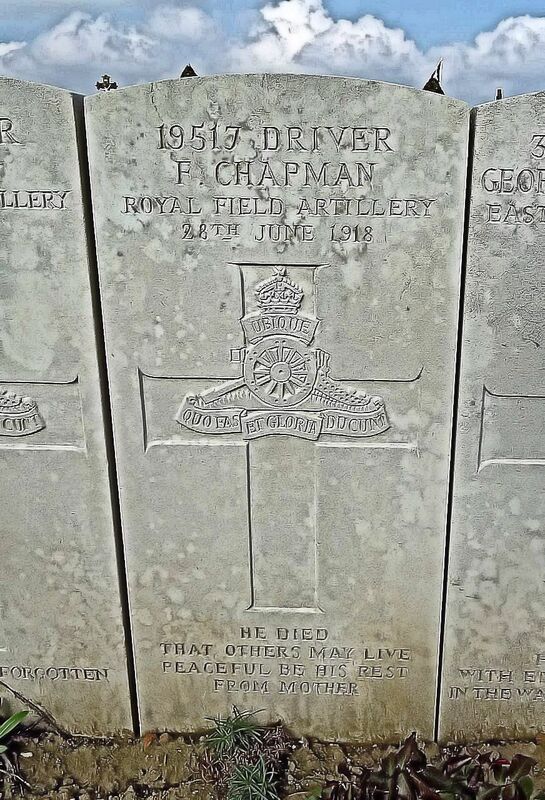 Chapman, Frederick, 30, 28th June 1918, 5th Div. Ammunition Col. Royal Field Artillery, 18517, Driver, Son of Dorcas Chapman, of 7, Woodlands, Upper Cwmbran, Newport, Mon., AIRE COMMUNAL CEMETERY, III. E. 10. 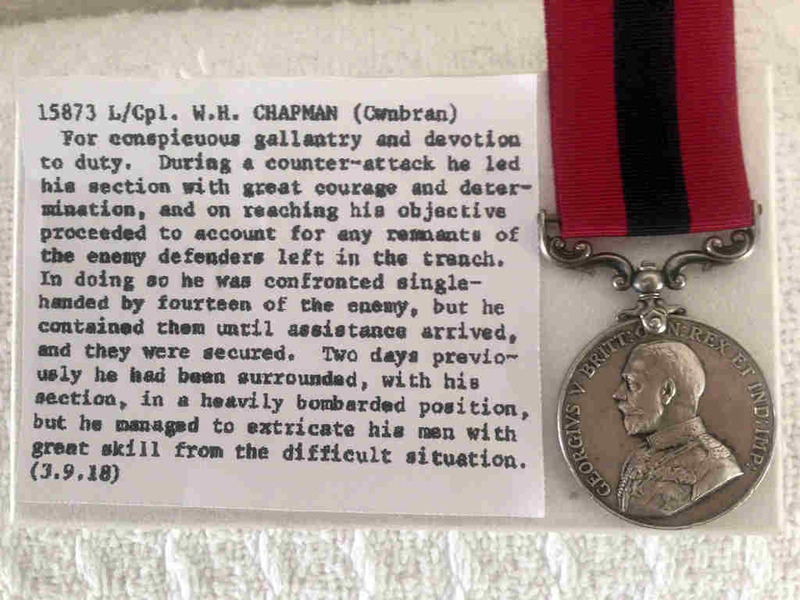 Chapman, William Henry, 5th October 1918, 1st. Bn. Soth Wales Borderers, Corporal, DCM, TINCOURT NEW BRITISH CEMETERY, V. H. 39. Clapp, Alfred Ira, 24, 19th October 1918, 18th Bn. London Regiment (London Irish Rifles), 591058, Rifleman, Son of Mrs. Ira Clapp, of 256, Upper Richmond Rd., Putney, London; husband of Mary Clapp, of 5, Brickyard Cottages, Cwmbran, Pontnewydd, PONTNEWYDD (HOLY TRINITY) CHURCHYARD, B. 154. 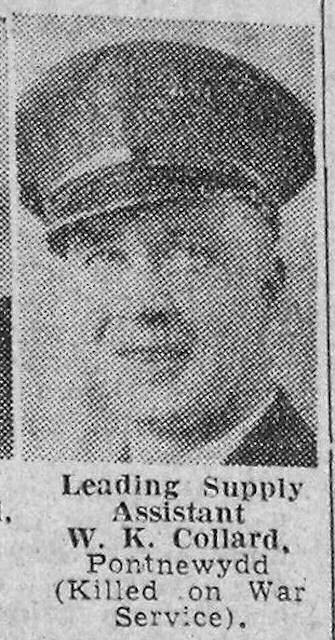 Coe, Cyril Rupert, 21, 17th May 1944, Royal Air Force Volunteer Reserve, 1409939, Sergeant (Air Gnr. 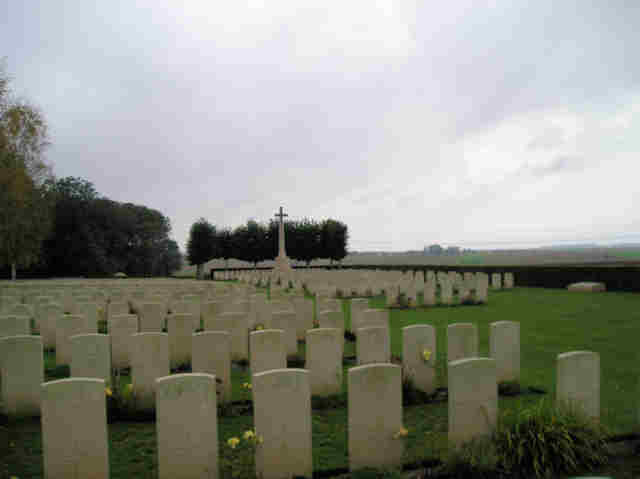 ), Son of John and Adelaide Caroline Agnes Coe, of Pontnewydd, Monmouthshire, DOVER (ST. JAMES'S) CEMETERY, Sec. F.R. Grave 22. 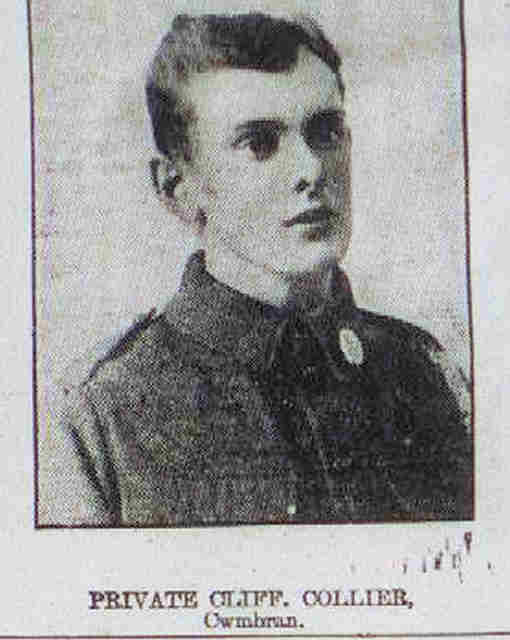 Cole, Raymond Henry, 19, 23rd November 1914, 2nd Bn. Monmouthshire Regiment, 2295, Private, Son of Ebenezer and Mary Ann Cole, of 12, Woodland St., Cwmbran, Mon., CALVAIRE (ESSEX) MILITARY CEMETERY, I. C. 4. 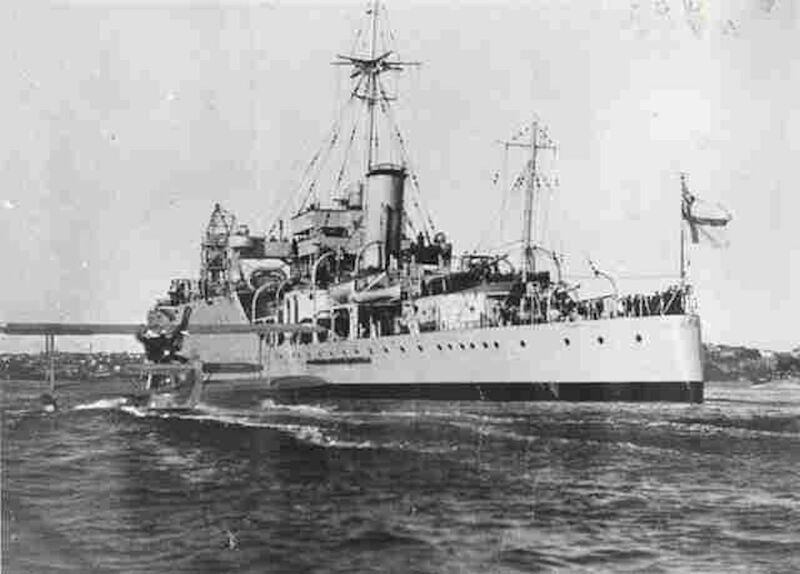 Collard, William Kenneth Llewellyn, 31, 15th May 1942, Royal Navy, H.M.S. 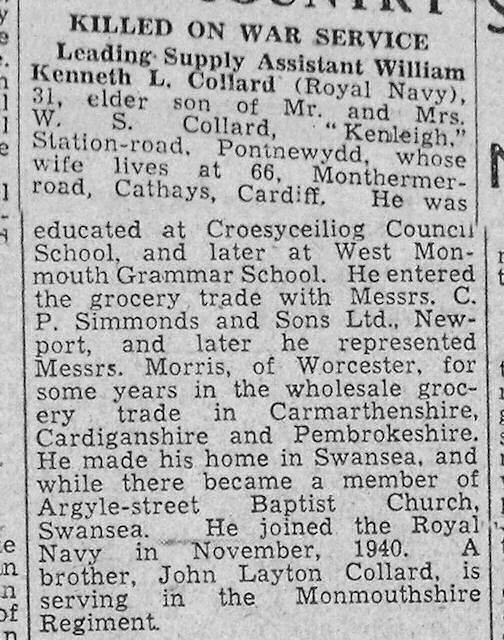 Hecla, D/MX 80195, Leading Supply Assistant, Son of William Samuel and Annie Collard; husband of Doreen Collard, of Cathays, Glamorgan, PLYMOUTH NAVAL MEMORIAL, Panel 71, Column 3. Collier, Clifford, 22, 13th May 1916, 4th Coy. 6th Bn. 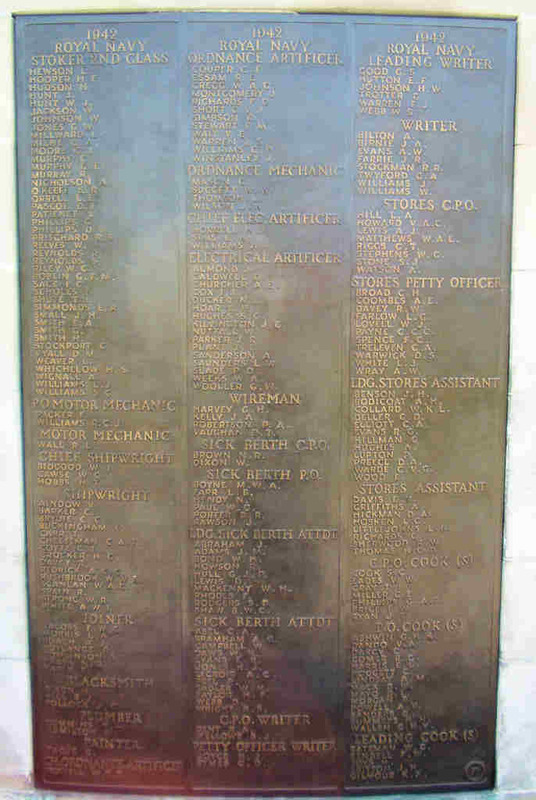 South Wales Borderers, 17221, Private, Son of W. L. and Louisa Collier, of 47, Victoria St., Cwmbran, Newport, Mon., ARRAS MEMORIAL, Bay 6. Cook, Samuel, 43, 20th July 1920, Royal Engineers, WR/1012, Son of the late John and Mary Ann Cook; husband of Annie Phoebe Cook, of 9, Park View, Ponthewyd, PONTNEWYDD (HOLY TRINITY) CHURCHYARD, Old Ground, Middle of Second Row. Cordier, Henry John, 27, 13th November 1916, 10th Bn. Royal Welsh Fusiliers, 34303, Corporal, Son of Charles and Katherine Cordier, of 100, Llantamam Rd., Cwmbran, Newport, Mon., QUEENS CEMETERY, PUISIEUX, D. 12. 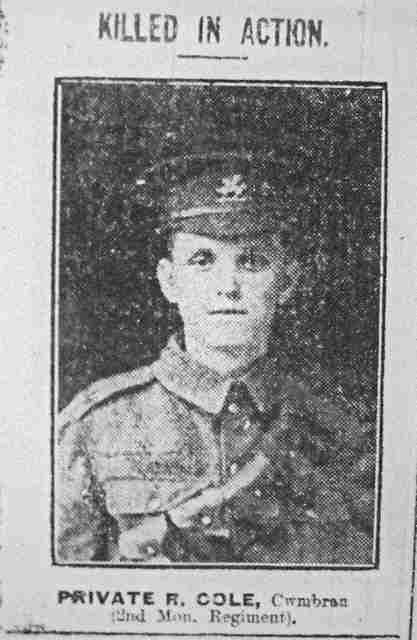 Cording, Albert, 27, 18th September 1916, 1st Bn. 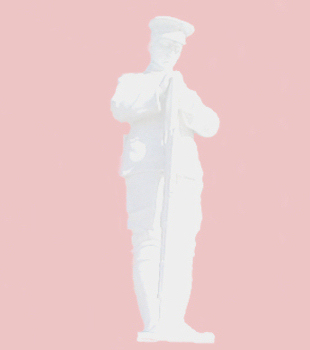 King's Shropshire Light Infantry, 19301, Lance Corporal, Son of Thomas and Elizabeth Cording, of Glebe Farm, Lledegveth, Caerleon, husband of Daisy F. Cording, of Post Office Terrace, Ponthir, Caerleo, Mon., THIEPVAL MEMORIAL, Pier and Face. 12A and 12.D. 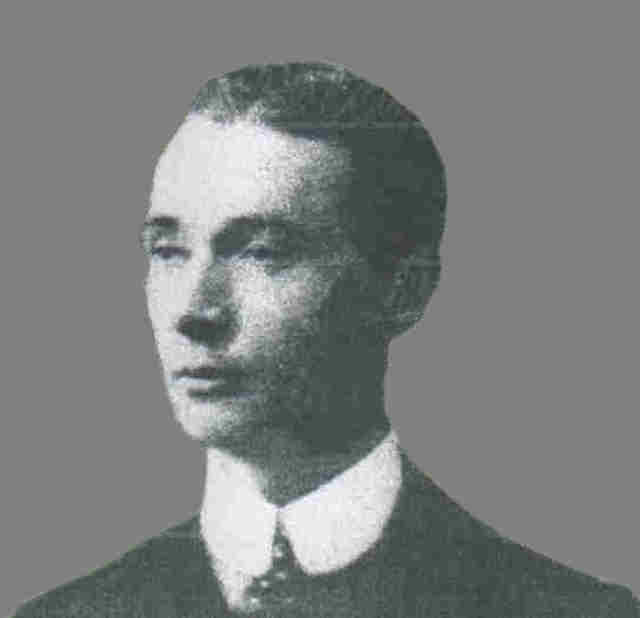 Cording, Arthur, 27, 16th May 1918, "C4" Reserve Bde. 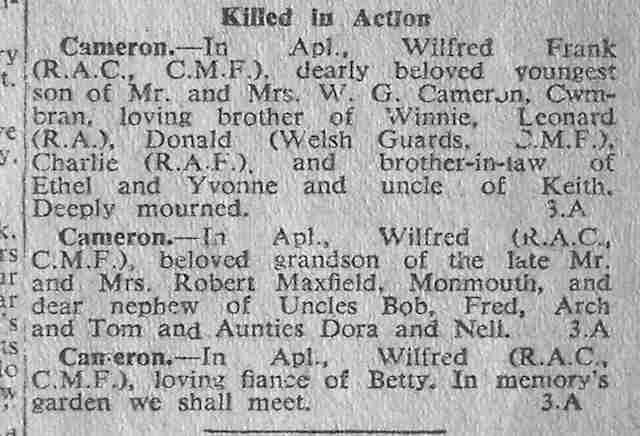 Royal Field Artillery, 831501, Gunner, Son of Mr. and Mrs. T. Cording, of Llandegreth, husband of Florence Ellen Cording, of 1, Chapel Row, Ponthis, Caerleon, Mon., LLANDEGVETH (ST. TEGVEDD) CHURCHARD. 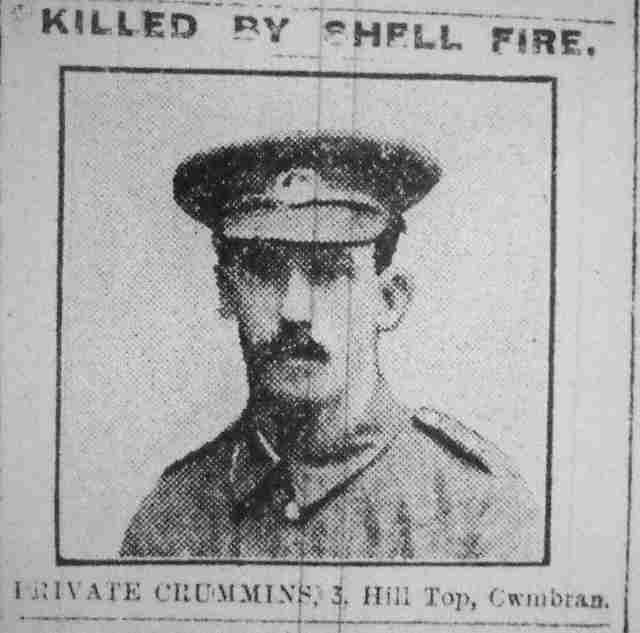 Crimmins, John, 25, 1st April 1916, 1st Bn. South Wales Borderers, 13758, Private, Son of James and Jane Crimmins, of Cwmbran; husband of Elizabeth A. Crimmins, of 56, New St., Pontnewydd, Newport, Mon., BULLY-GRENAY COMMUNAL CEMETERY, FRENCH EXTENSION, A. 57. Cumbley, R, 30, 19th September 1918, 8th Bn. 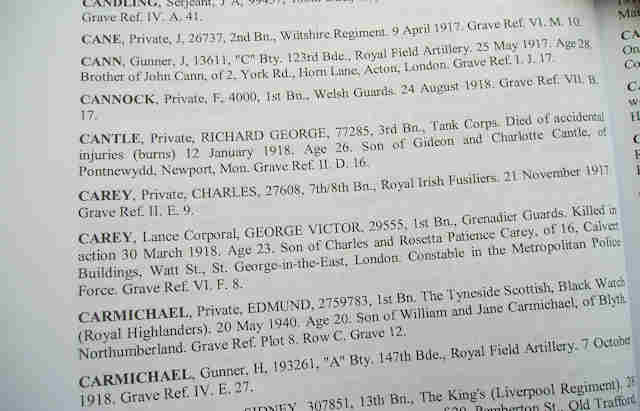 Royal Berkshire Regiment, Second Lieutenant, Son of C. N. and Edith Charlotte Cumbley, of 130, Llantarnam Rd., Cwmbran, Newport, Mon., UNICORN CEMETERY, VEND'HUILE, III. A. 19.